Mary Lou McDonald has come under heavy criticism for her use of a slogan long associated with the IRA. She rallied supporters as she assumed the leadership of Sinn Féin, exclaiming "up the rebels agus tiocfaidh ár lá". The Dublin TD took over from Gerry Adams unopposed on Saturday after his more than three decades in charge of Sinn Féin. Her remarks were last night criticised by politicians on both sides of the Border. They were said to hark back to a "dark time" when the Provisional IRA was engaged in its campaign of terror as well as a "missed opportunity" to demonstrate Sinn Féin had changed. 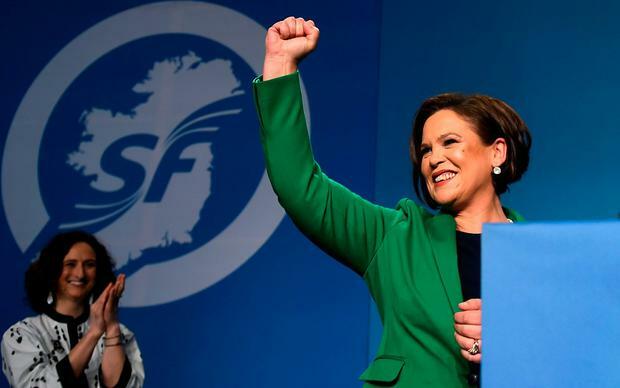 The use of the divisive phrase arguably overshadowed parts of her speech that spoke of the need for reconciliation and how Sinn Féin wants to achieve a United Ireland with "graciousness and generosity". Fianna Fáil TD Darragh O'Brien said her words were "ill-judged" as sensitive talks continue to re-establish power-sharing with unionists in the North. He added: "Comments like that really hark back to a very dark time in the island's history when many people were murdered by the Provisional IRA." Mr O'Brien also said: "I'd like to see the end of those types of phrases", arguing that they are "very unhelpful" amid the ongoing negotiations in the North. Former Ulster Unionist Party (UUP) leader Mike Nesbitt said unionists won't be disappointed by the speech because they didn't have high hopes for it. But he said that given Ms McDonald took over the leadership unopposed, and didn't need to reassure her base, it was "a missed opportunity to deliver change". He added that she spoke of fresh-thinking and bold ideas "but ended with the same, stale rhetoric of 'up the rebels' and 'tiocfaidh ár lá'." Mr Nesbitt said: "Unionism will not be slow to identify the contradictions." He also said: "Now the speech is over, let's see what she has to offer in next week's talks in Belfast." Sinn Féin has said it expects talks on re-establishing the Northern Executive to conclude this week. Ms McDonald said she thinks her party can do business with DUP leader Arlene Foster, and the new Sinn Féin leader said yesterday: "I very much hope we get the institutions back up and running. "The issues are clear, the issues are resolvable." There were no direct references in Ms McDonald's speech to atrocities carried out by the Provisional IRA but she insisted "the war is long over". She denied that her elevation to the top in Sinn Féin was a "coronation", arguing that it was a democratic decision. Her use of the phrase "tiocfaidh ár lá" was apparently unscripted as it did not appear on a version circulated to the media shortly before she spoke. 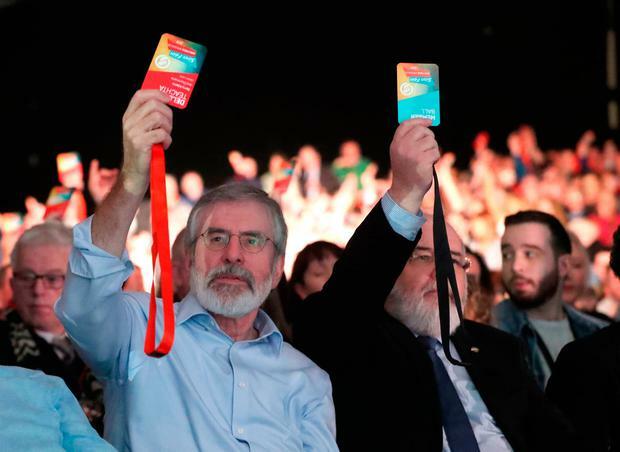 There was a standing ovation among the more than 2,000 party faithful gathered in Dublin's RDS. Fine Gael Senator Kieran O'Donnell clashed with Sinn Féin TD Pearse Doherty over her remarks on RTÉ Radio. Mr O'Donnell argued that they were "irresponsible" with talks in the North at a "very delicate stage". Mr Doherty insisted that unionists know well that Sinn Féin is a republican party and wants to achieve a United Ireland and denied her comments were odd. Last night Sinn Féin said criticism of Ms McDonald's remarks was "nit-picking" and maintained it was "a tremendous speech". A statement said that "any fair analysis" showed she spoke of "reaching out to our Unionist neighbours and respecting each other's beliefs and traditions". It also said Sinn Féin is in the business of delivering change "which seems to be a challenge to other parties".